A single play in basketball can involve sprinting, jumping, changing directions and lateral movements. To maximize your performance with each of these skills, you must use sport-specific exercises in your strength and conditioning program. Along with general strength and speed, you must also possess power and endurance that can be improved through strength-training, power endurance exercises, metabolic conditioning and flexibility exercises. 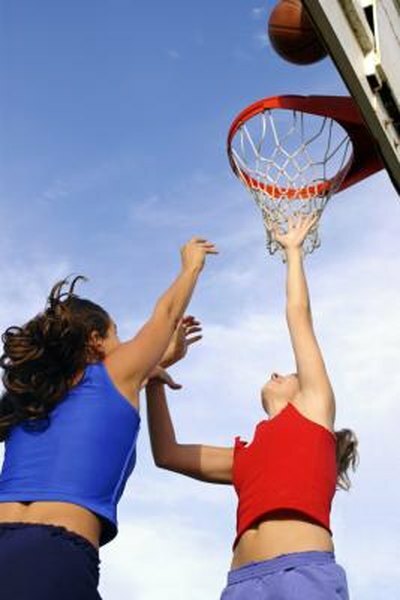 Strength-training exercises for basketball players must resemble the movement patterns used in a game. For example, lower body functional exercises such as the squat and deadlift resemble natural movements performed by the body while jumping or playing defense. Similarly, upper-body exercises such as pushups and pullups resemble movements used while passing or rebounding. Strength-training exercises are an important component to the year-round strength and conditioning program, but you need to focus on building maximal strength during the off-season and early preseason training phases. Power is a combination of speed and strength while power endurance refers to your ability to maintain a high power output for an extended period. Performing power endurance exercises such as plyometrics can improve your overall basketball skills by allowing you to play all four quarters at a high-intensity level. The best plyometric exercises for basketball players use jumping movements or medicine ball exercises such as squat jumps, bounding, box jumps or medicine ball throws. Focus on performing power endurance exercises during the late preseason training phase with two to three workouts per week. Metabolic conditioning for basketball players refers to the specific anaerobic energy systems used during physical activity. Basketball players use primarily the phosphagen system for short, high-intensity exercise and a small portion of the glycolytic system for moderate-intensity exercise. To match the specific metabolic demands of a basketball game, conditioning exercises such as running should last from 10 to 30 seconds followed with 30 to 90 seconds of work repeated for 25 to 30 rounds to train the phosphagen system. For the glycolytic system, perform conditioning exercises for 30 to 120 seconds followed with 60 to 240 seconds of rest repeated for 10 to 20 rounds. Flexibility and stretching exercises are an essential component to a well-rounded basketball strength and conditioning program. Without flexibility, you will lose range of motion, which can lead to injuries. Include flexibility exercises into your normal training program at least three days per week with any workout. The best flexibility exercises include static stretches in which you hold the stretch for a specific amount of time and dynamic stretches such as calisthenics and form running drills. How Often Should I Do Rotator Cuff Exercises?